You borrow a spectator's credit card -- any color or style will work -- and with a wave of your hand, you cause the markings to disappear completely. You are left with a clear credit card that can be immediately inspected by the spectator. Upon command, you change the credit card back to its initial condition and hand it right back. Blankrupt is a unique "omni" style prop that allows you to turn a borrowed credit card clean. Easy, medium, and difficult methods are taught by creator Josh Janousky, and you are supplied with two durable, clear credit cards that will last a lifetime of performances. Although there are many effects that allow you to make an object clear, a vast majority are objects that you, the performer, must supply: your pen, your cards, your coins. Blankrupt is unique because the object you make clear is a borrowed, precious object: a spectator's credit card. If you're looking for an outstanding, non-card quickie that is visual and impactful, look no further than Blankrupt. Available in two styles: Thin Strip (8.5mm - USA and Canada cards) and Thick Strip (13.5mm Rest of world). Please contact your sales rep if you want to check which size is best for you. NOTE: Blankrupt has been developed with permission from Alan Rorrison, who has previously worked on this concept. "I love Omni effects! Josh has taken it from a card trick to an organic miracle." "A card trick that non-magi would care about. What's not to like?" "Blankrupt is the only omni plot that makes sense. It's something I carry in my wallet at all times." 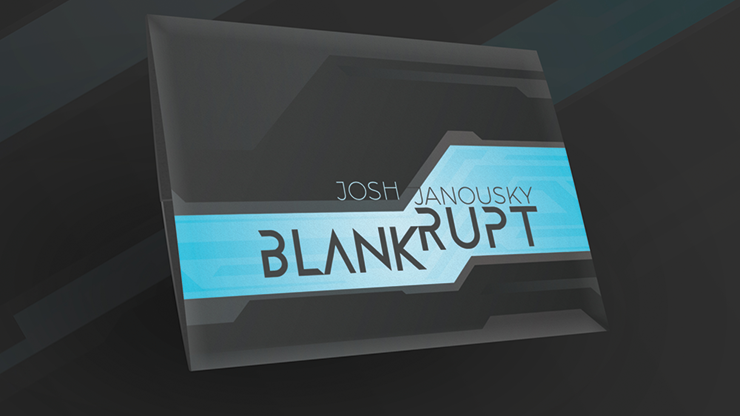 "Blankrupt reimagines a classic plot with an object that people care deeply about. It's a perfect marriage!"